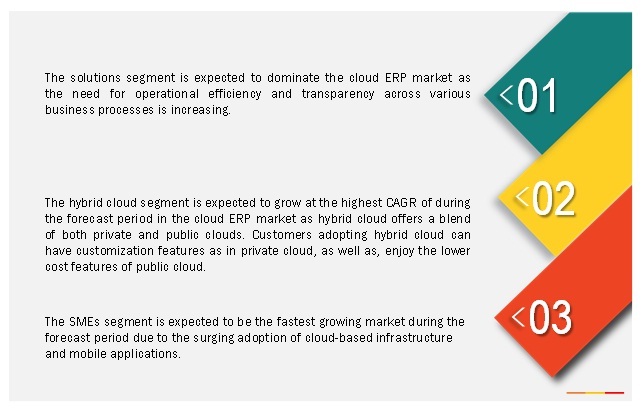 [171 Pages Report] The Cloud ERP Market size is expected to grow from USD 18,524.6 million in 2016 to USD 29,844.5 million by 2021, at a CAGR of 10.0% during the forecast period. Cloud ERP solutions secure data at rest and in motion through various standards and protocols. Increasing need for operational efficiency and transparency across various business processes, rising demand of ERP solutions and services from SMEs, and surging adoption of cloud-based infrastructures and mobile applications have led to growth of the cloud ERP market. The base year for the study is 2016 and the forecast period is considered to be 2016 to 2021. Organizations feel the need to adopt cloud ERP solutions when there is mismanagement of data and resources or a need for growth of business systems. Without ERP solutions and services, the gap between software capabilities and business process widens, which hampers the organizations’ overall growth. Lack of systems integration and non-availability of real-time data leads to stymied operational efficiency, causing a dip in productivity and profitability of the company. There is a need for improving operational efficiency while adopting inorganic growth is addressed by the adoption of cloud ERP solutions. During collaborations, mergers, or acquisitions, employees can communicate more effectively and decision makers can have access to real time data and thereby improve the overall operational efficiency. With a traditional on-premises ERP solution, this may not be possible, which can lead to silos in geographically dispersed organizations and decisions being made based on inaccurate data. With cloud ERP solutions, an organization can reach out to more than 30,000 people within less than 2 years, which would have ideally taken more than 5 years with non-cloud ERP solutions and services. Reduced time to market and speed of implementations benefit organizations and drive them to speedy growth and profits. The cloud ERP market comprises key vendors, such as Microsoft Corporation (US), Oracle Corporation (US), SAP SE (Germany), Infor (US), Sage Software, Inc. (UK), Epicor Software Corporation (US), Intacct Corporation (US), FinancialForce (US), Plex Systems, Inc. (US), and Ramco Systems (India). These vendors sell market to end-users to cater to their unique business requirements and security needs. In August 2016, Infor acquired Starmount, a modern store systems provider serving large and midmarket retailers. The acquisition will enable Infor to accelerate delivery of Infor CloudSuite Retail, a new, modern suite of enterprise applications delivered in the cloud and designed for today's retailing landscape. In August 2016, Plex Systems acquired DemandCaster, a leader in cloud-based supply chain planning solutions. The acquisition enables Plex manufacturing cloud to deliver the industry’s first comprehensive suite of cloud applications for running manufacturing enterprises, from ERP and Supply Chain Planning (SCP) to Manufacturing Execution (MES). In August 2016, FinancialForce collaborated with LiquidHub, a customer engagement company, to develop a more efficient back-office solution and eliminate redundant silos, by implementing FinancialForce’s Professional Services Automation (PSA) and FinancialForce’s Human Capital Management (HCM). What are new application areas and business functions which the cloud ERP companies are exploring? The cloud Enterprise Resource Planning (ERP) market size is expected to grow from USD 18,524.6 million in 2016 to USD 29,844.5 million by 2021, at a CAGR of 10.0% during the forecast period. 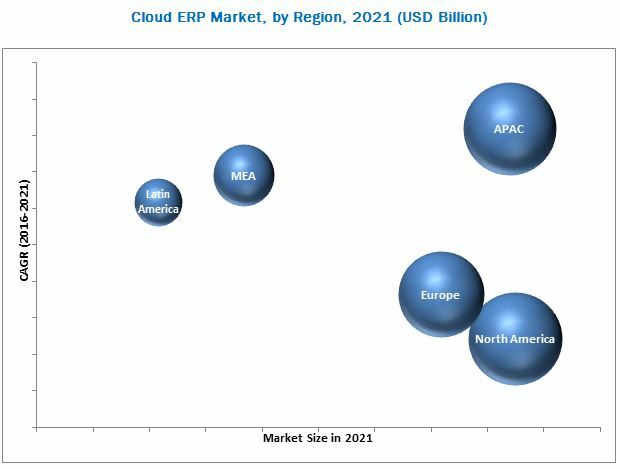 The major growth drivers of the cloud ERP market include increasing need for operational efficiency and transparency across various business processes, rising demand of ERP solutions and services from Small and Medium Enterprises (SMEs), and surging adoption of cloud-based infrastructures and mobile applications. Cloud ERP solutions are deployed over the cloud environment and make use of cloud computing platforms and services to provide businesses with flexible business process transformations. ERP implementation revolutionizes management across large enterprises as well as SMEs, helping them to improve their operations and making them manageable and more transparent. Vendors offer cloud-hosted ERP solutions that efficiently help organizations manage processes across functions such as finance, marketing, sales, operations, and human resource. Moreover, major solution suppliers offer supporting services such as integration and training along with support & maintenance for the smooth transition and implementation of cloud ERP solutions. The cloud ERP market by component has been segmented, on the basis of solution and services. The market for services segment is expected to grow at the highest CAGR between 2016 and 2021. The high adoption of cloud ERP solutions and services by the global organizations contribute to the rapid growth of the market. The cloud ERP market by deployment mode has been segmented into public cloud, private cloud, and hybrid cloud. The public cloud segment is expected to have the largest market size in the deployment mode by 2021. The hybrid cloud segment is expected to grow at the highest CAGR during the forecast period in the market as hybrid cloud targets two major concerns, scalability and security, at the same time, which is difficult to attain by using public or private cloud deployment. Hybrid cloud is a perfect blend of customization, scalability, and attractive pricing, wherein, the data is distributed on both public and private clouds. The BFSI vertical is the fastest-growing vertical in the cloud ERP market. With the growing usage of web and mobile applications for banking transactions and payments, the market for cloud ERP in the BFSI vertical is expected to grow at the highest CAGR. The aerospace and defense vertical is expected to grow at a significant rate during the forecast period as cloud ERP solutions and services help customers in planning, costing, and inventory tracking. Cloud ERP services for BFSI organizations offer multiple benefits, such as, business agility, cost savings, and assertion of business continuity. Advanced solutions and services in the cloud ERP market are overcoming the odds of data confidentiality, security, regulatory compliance, and quality of service; hence, BFSI is a prominent vertical availing the cloud-based data management services. Cloud ERP services enable the industry to improve upon the banking performance and boost operational efficiency. The banking industry is adopting online platforms as a way of managing services and enhancing the way customers can get information related to accounts and finances. Manufacturers are looking to integrate disparate locations, ensure data integration, enhance business process efficiency, and increase end-user workforce productivity. The manufacturing businesses need flexible solutions to evaluate their sales and revenue performances. Cloud ERP services offer additional features and tools to ensure the security of data and communications. The state-of-the-art cloud-based solutions and services enable vendors in the manufacturing industry to tackle data storage and management snags with limited cloud-based IT capabilities, integrated into their IT infrastructure in a cost-effective fashion. Aerospace is one of the most significant industries in the cloud ERP market. Cloud ERP manages logistics & supply chain, tracing of serial number of inventory items, production control, audit trail records, work order issue & work order receipts, subcontract purchase issues, labor & machine bookings, sales order fulfilments, Return Material Authorization (RMA) receipts & advanced shipments, site-to-site inventory transfers, and division-to-division inventory transfers, as well as, any reversals of these functions. Cloud ERP has features like planning, costing, and inventory tracking. The scheduling module will schedule operation steps for work orders by the work center. What are the applications areas of cloud ERP? The availability of open-source ERP solutions is a major challenge in the growth of the market. Open-source ERP solutions such as the ERPNext by Frappé Technologies, iDempiere, Odoo, webERP, and Openbravo are designed and developed to have all the features of traditional ERP solutions, but the source code is made publicly available. The open-source model caters additional benefits to the companies compared to the traditional ERP and cloud-based ERP. The open-source model allows companies to access the ERP system's code and customize it using their own IT department instead of paying extra for vendor customization services and licensing, as is typically the case with closed source programs. Open-source ERP is a viable option, but the companies must have an IT staff with ERP development and programmable skills. Traditional ERP and cloud-based ERP vendors may not offer additional customizations, which in case of open-source ERP are covered. SMEs adopting such open-source ERP solutions seldom need to pay for upgradations, customizations, and support fees, making them favorable across the industry. However, the presence of such solutions in the market hampers the market presence of major cloud ERP solutions, directly hitting their profitability. The key players in cloud ERP market include Microsoft Corporation (US), Oracle Corporation (US), SAP SE (Germany), Infor (US), Sage Software, Inc. (UK), Epicor Software Corporation (US), Intacct Corporation (US), FinancialForce (US), Plex Systems, Inc. (US), and Ramco Systems (India).